S.U.E.T. is a card game where you play the role of one of four evil geniuses trying to gain entry into the Society of Ultimate Evil and Terror. The Society has declared that the first genius to construct their own unique doomsday device will be allowed to join. You will play cards not only to help construct and defend your doomsday device, but also to thwart the efforts of your competitors on your quest to become a member of S.U.E.T. Maybe once your in, you can help them come up with a better name! 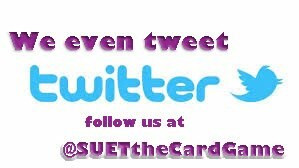 The Cards: There are five different type of cards you will use in SUET. 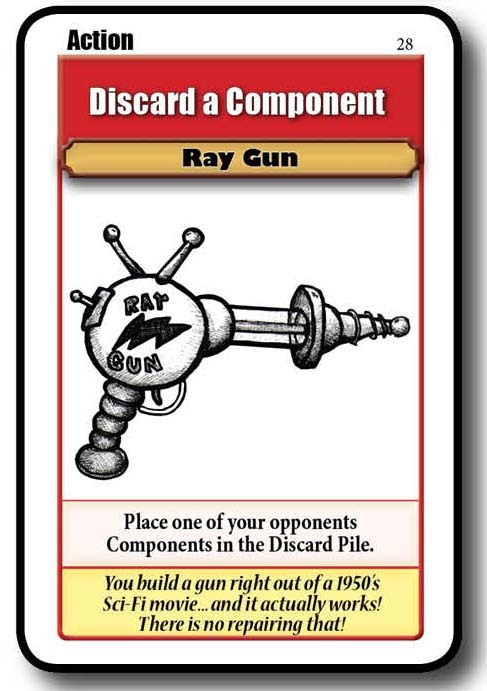 Instant Action Cards: These cards are used to help you build and protect your Doomsday device, as well as mess with your competitors. You can play as many of these cards as you want and at any time you want, unless the rules text on the card says otherwise..
Action Cards: Cards of this type work just like Instant Action cards, except you can usually only play one card a round and only on your turn. 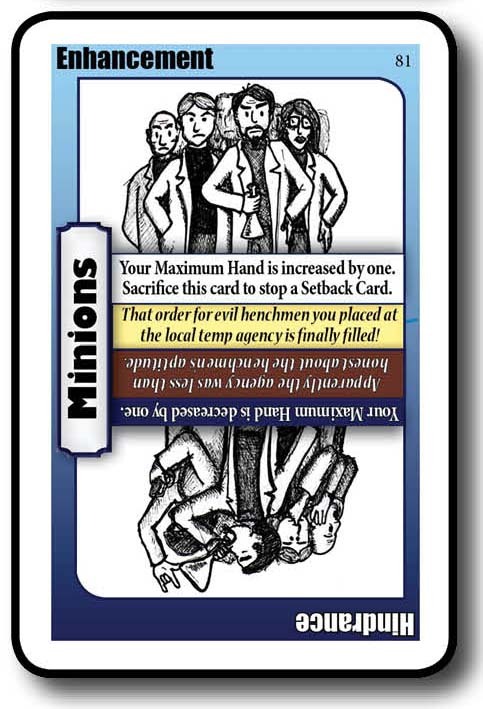 Setback Cards: When these cards are drawn on the first draw of your turn, it means bad things happen to you. However, if you receive them in any other way, you keep them in your Hand and can play them on your opponents. Enhancement Cards: These special cards give you a special ability for as long as they are in your Lab. 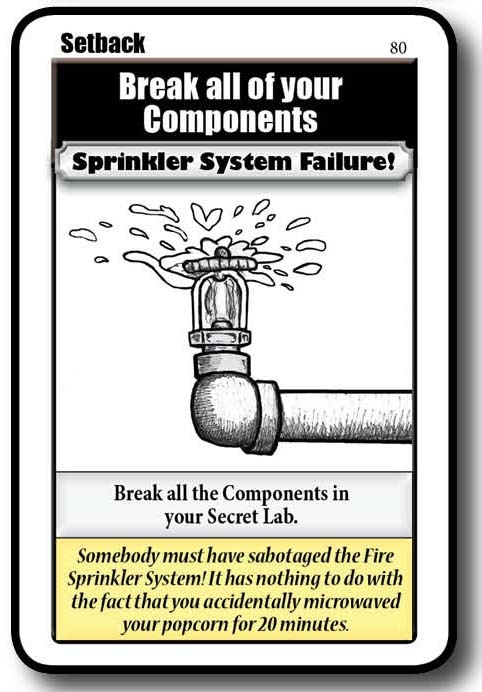 There can only be one of these type of cards in your Lab at one time. You must be careful though, as they can be converted to Hindrances which will give you a negative effect until removed. You can also discard your Enhancement Card to block a Setback card, whether it is drawn or played on you. You can play an Enhancement Card as a Hindrance on someone else as long as they don't have another Enhancement in play already. How to Win: The first player to play one of each color of Component Cards into their Lab (see below) that are unbroken wins the game. 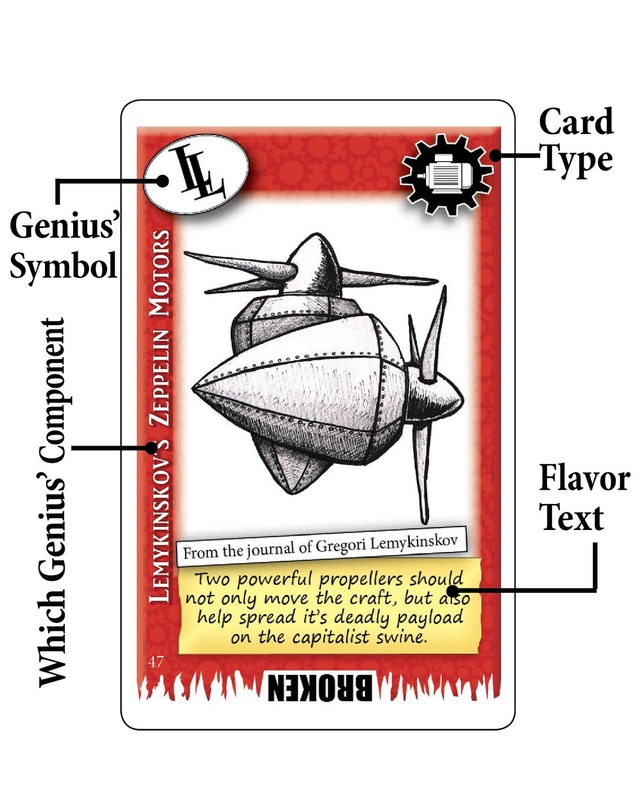 Anatomy of the Cards: This is a brief look at the parts of the cards. Card Name: Name by which the card is referenced. 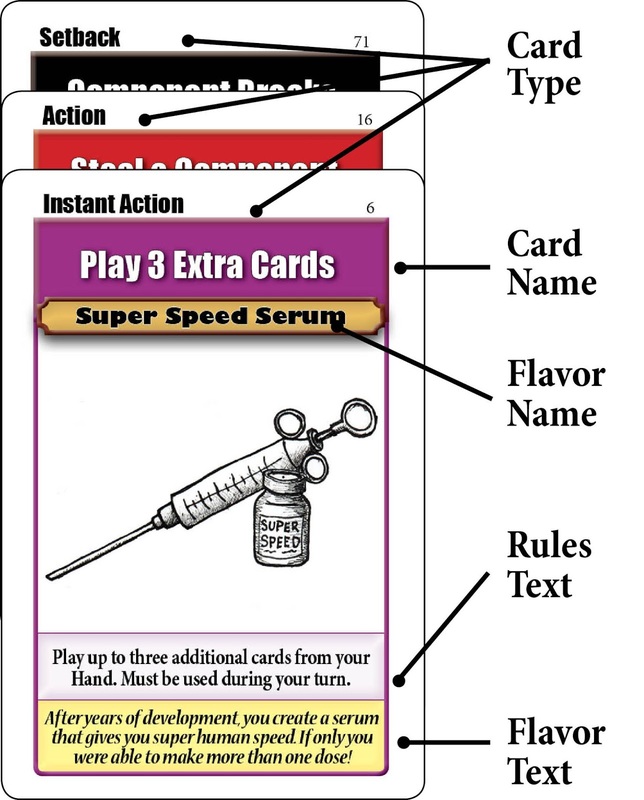 Rules Text: This is a brief summation of the rules associated with the card. Which Genius’ Component: This will indicate who can use the Component. Universals can be used by all. 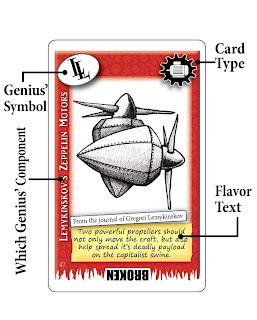 Genius’ Symbol: This is another way of quickly identifying which Evil Genius the Component belongs to. that you will need to set-up/maintain. The Deck: Set this up in the middle of the table where everyone can reach it. When/If the Deck runs out, shuffle the Discard pile and make this the new Deck. Discard Pile: This should also be set in the center of the table near the Deck. Players may look at the Discard pile at any time, but may not change the order of the cards. The Black Market: This should also be set up in the middle of the table near the Discard pile. Players may look through the Black Market any time they want as long as they make sure that all the cards remain in the same order. 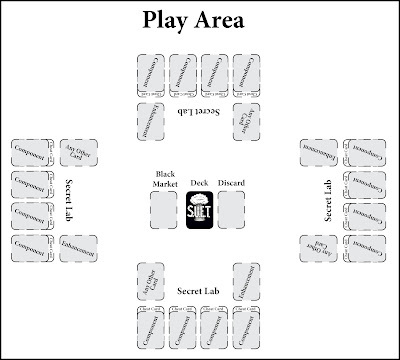 Lab: This is the area immediately in front of the players where they will place their doomsday device’s Component Cards, Enhancement Cards or any other card that you are told to place in your Lab. S.U.E.T. has two ways to play. 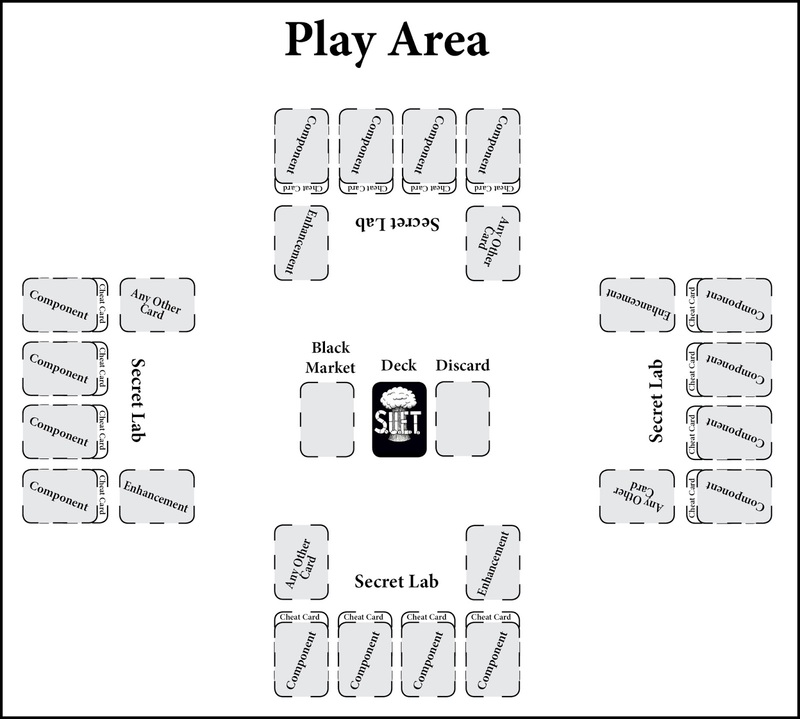 The first is a quick, less complex game that allows you to play many hands in a session. The second way adds a new mechanic that will make for a more challenging game and longer game. 1. Pick an Evil Genius: You can either have everyone pick who they want to be or randomly select a genius. 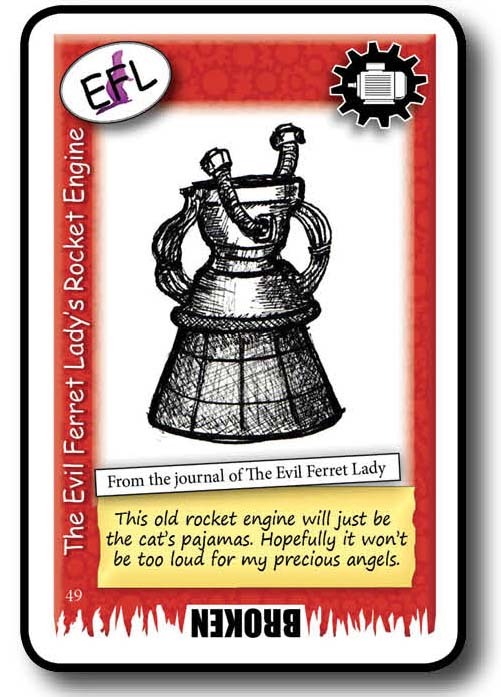 Take your Evil Genius Card and place it in your Lab. 2. Determine who goes first: The player with the best maniacal laugh goes first. 3. Seed the Black Market: Place one set of Universal Components into the Black Market. 4. Deal out four cards: Shuffle the Deck and deal four cards to each player. Remember, if you are dealt a Setback Card, it goes into your hand and you can play it on other players on your turn. 5. Set up the table: At this point, just set the Deck in the center of the table. Leave room for other game areas as indicated in the diagram above. do what the card says to do and proceed to step III. If it isn’t place it in your Hand. II. Play: The player must do one of the following actions on their turn. a. Pass - If you have 3 or less cards in your Hand, then you can simply end your turn. c. Play a Card - Playing an Action, Enhancement or Setback Card all count as a play. Instant Actions do not count as a play. “purchased” goes into your Hand. change through the course of the game. IV. 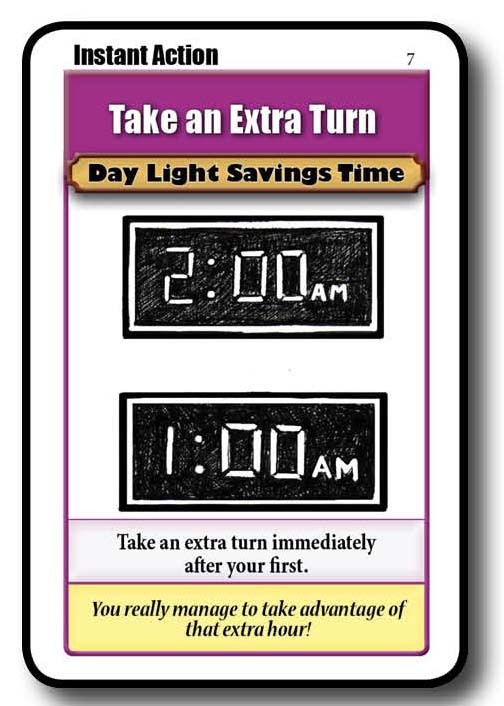 End Turn - Play proceeds clockwise to the next player. 7. Win! : When all players have gone, if no one has won, repeat step 6-7. 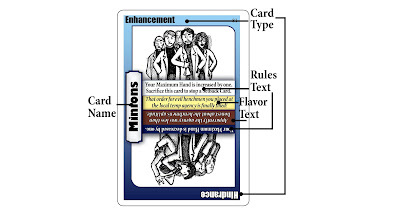 All of the cards have a short description of their rules in the Rule Text section of the card. Space was a bit tight so here are some additional explanations for a few cards. People have asked when the cards effect begins. The answer is immediately when placed in your or your opponent’s Secret Lab. So if you get a free Build or Repair you can use them immediately. If a Hindrance is played that reduces your Hand Limit, you must immediately discard down. 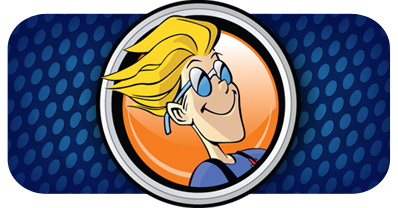 If you have another Enhancement Card in your Hand and you want to replace one that is in your Secret Lab, no matter which side is up, simply place the unwanted card in the Discard Pile and place the new one in its place. This counts as an action and is one of the ways to get rid of a Hindrance. Just as a reminder, when the Hindrance side is up you cannot use it to block a Setback Card. If you have this Hindrance and play the Repair All of Your Components Card, you only have to discard one card. If you have no cards to discard, then you cannot play the repair card. If someone has used a Cheat Card with an opponent’s Component it will not travel with the Component if it moves later in the game. If a card has you steal, discard or move a Component in any way, the Cheat card is placed in the Discard Pile. I have also been asked, “Can you use a Block an Action Card on another Block an Action Card?” Absolutely! And in turn, someone can Block the Block of the Block. Last Block is the one that gets to Block. Did that make any sense? If you play this in conjunction with a Card that tells you to randomly do something to an opponent’s Hand, you get to choose the card you want. It won’t be random. ie. If you play this with a Steal a Card, instead of taking a random card from an opponent Hand, you look at all their cards and take the one you want. If your Component is in your Lab and it is Broken you can repair it with a Repair (or Repair All) Card, a special Enhancement Card power or replace it with an unbroken card of the same color. Replacing the broken Component will count as an action and the “broken” Component card will be put in the Black Market. The Component is no longer be Broken when it goes to the Black Market. I figured the folks at the Market would fix it up for re-sale. However, if a broken Component is stolen by another evil genius and placed in their Lab, then it would stay broken. If a Broken Component ever goes back into your Hand, then it will not be Broken when you play it back into your Lab. Whent these cards are played the Actions granted will carry over if other Cards are played. For example: If you play a Take 3 Extra Action Card and then play a Trade Hands or a Discard A Hand card, you can use left over plays with the new hand.